The Orioles and Yankees played a wild one that started almost three and a half hours late due to rain and took over three and a half hours to play. The end result was a 7-5 Orioles win, giving them a 2-1 season record! Dylan Bundy had his troubles but solid relief from John Means and three home runs paved the way to victory. Renato Nunez jumps to the lead in the first inning. YES. Happ started the game for the Yankees and he was in trouble almost immediately. Dwight Smith Jr. drove a double to the right-center gap then Trey Mancini lucked into an infield hit to put two runners on for Renato Nunez. Nunez, who was serving as the designated hitter, did some hitting. He hit a Happ fastball to dead center field where it landed over the wall for the three-run homer. Two innings later the Orioles padded their lead thanks to Trey Mancini's first home run of the season. Nunez followed with his second hit of the day but he was based on an inning ending double play from Rio Ruiz. Nunez would also reach base on a walk later in the game, making it a pretty good day at the plate for him. And it has a good thing about the games started with some runs, because they needed them. It's not great when starting pitcher can make it out of the fourth inning, or when it throws over 90 pitches in that span. And it's definitely not good when he walks five batters in fewer than four innings. And, most importantly, it's not good when your starting pitcher gives up three runs in 3.2 innings, even if they scored after he came out of the game. But while the results definitely aren't there, Bundy did have some positives in this game. Like I mentioned, he didn't give up any home runs. And he had some filthy pitches, which struckout him in a racking up seven strikeouts. Unfortunately they are just frequent enough to keep him in the game long enough to put together a respectable outing. Through the first two innings, Bundy looked at a slightly elevated pitch count. The only base runner in those two innings was Giancarlo Stanton, who Bundy walked on four pitches and looked like he wanted no part of. After the second inning I was feeling pretty good about Bundy. It's just too bad baseball games last longer than two innings. 0 pitches in the process of walking number nine hitter DJ LeMahieu. That batter is really where the pitch count started to get out of hand. Bundy got the next two batters before walking Stanton for the second time in the game. A strikeout of Luke Voit got him out of the inning. As the fourth entry I said to myself, "A quick inning here and he might get through five." Spoiler: He didn't have a quick inning. A single from Miguel Andujar started the fourth inning for Bundy, and two strikeouts and two walks later, that was for him. At the time he hadn't allowed any runs, but it was definitely time for him to go. As manager Brandon Hyde took the ball from him on the pitching mound, Orioles fans all over the world wondered if Buck Showalter would have done the same thing. My guess is now. Replacing Bundy was lefty John Means, who appeared in one game last year when he allowed five runs in just 3.1 innings. So if you didn't have any confidence in him, that's ok. He started his 2019 season with a 11-pitch base loaded to Brett Gardner, cutting the Orioles lead to 4-1, then a two-run single from Aaron Judge made it a one-run game. But Means struck out Stanton to end the inning. Means went on to pitch three more innings. She didn't dominate the Yankees, that's for sure. But he held his own, including getting out of trouble in the sixth inning by striking out Judge and Stanton with two runners on. He finally got a run of his own in the seventh inning when catcher Gary Sanchez hit a monster home run to left field. The Orioles added their fifth run in the fifth entry thanks to Jonathan Villar's speed. Villar reached base on an infield, must beating out the throw. He then stole second and goes to third when catcher Gary Sanchez's throw ended up in center field. A single from Smith knocked in Villar. Team speed! And they added two more in the eighth inning on a two-run homer from Joey Rickard! After hitting zero home runs through their first two games, they hit three in today's game. Wild. Mychal Givens replaced means to start the eighth inning and while he was successful, it was pretty stressful. Why am I stressed out about a team that is supposed to be bathing? Your guess is as good as mine. With one out, Givens hit LeMahieu. He then got a ground ball back to him that should have become a double play, but Givens threw the ball into center field to put runners on first and second. He struck out Judge but walked Stanton to load the bases and brought the go ahead to the plate in the form of Voit. But Voit grounded out and the inning was over. Even after pitching yesterday, Givens came back out for the ninth inning. It was surprising, but at first it seemed like maybe he'd have an easy ninth inning. He did not. He retired the first two batters but then Greg Bird and Torres walked to a ball deep into the hole at shortstop and beat it out. A single from LeMahieu knocked in Bird and Givens looked gassed. Hyde thought so too and he turned to lefty Paul Fry to face Brett Gardner. The Yankees countered with pinch hitter Troy Tulowitzki, who had homered earlier in the series. A home run in this situation would be of the walk off variety. Instead, he was eliminated and the game was over. Hooray! 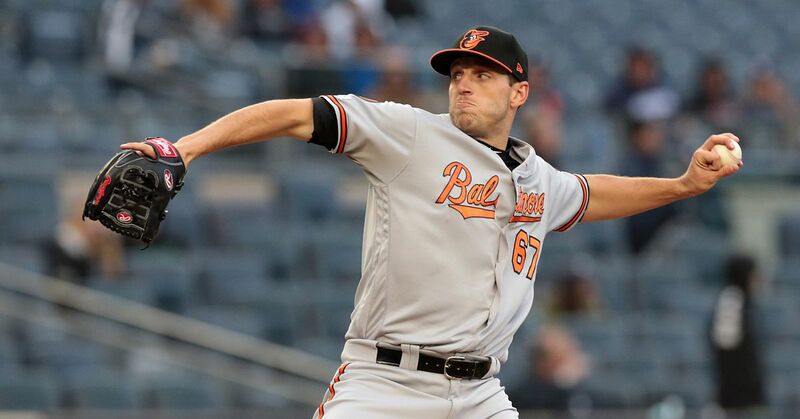 Your Baltimore Orioles just took two out of the New York Yankees to start the season. There will probably be plenty of bad times ahead in 2019, but this series win feels pretty darn good. Who was the Most Birdland Player for Sunday, March 31st?